Interested in performing Umrah this year? I’timaar offers you a chance to visit the holiest city of Makkah and perform Umrah in the month of November which is the best time to visit Saudi Arabia. The weather is considerably cooler with less humidity and wind. It is also less crowded in terms of people travelling for Umrah which gives you a chance to visit all the ziyarat places in Mecca and Medina in a relaxed way. November Umrah Package also costs you much less because of low-cost airfare and cheaper accommodation available at this time of the year. You are able to perform all the rituals easily and kiss the black stone ( Hajr-e-Aswad ) while performing Umrah which becomes difficult to reach during the peak season. Our tailor-made cheap November Umrah packages offer you a chance to travel to Makkah (Mecca) on a unique spiritual journey to fulfill your dream of performing Umrah. I’timaar also specializes in customized group Umrah tours, so if you wish to perform Umrah with your whole family, count on us to provide you the best services. Our team of experts will ensure that you have a smooth journey eliminating any hindrance that could create discomfort. With an extensive experience in planning Umrah tours, we take care of every single aspect of your ziarat and provide you the world-class services ensuring that your Makkah stay remains joyful. Explore all the important sacred sites of Makkah and Madinah to make the best of your Ziyarat tour. With our special November Umrah Package, I’timaar offers you an affordable, hassle-free spiritual tour to Makkah for Umrah. Also, travel to the city of the Prophet (pbuh), Madinah to see and understand the life that Allah’s Messenger (pbuh) and his companions (RA) led. One of the top Hajj and Umrah tour operators in the United Kingdom, I’timaar has been serving scores of pilgrims every year. We have been successful in gaining the trust and devotion of our customers through our unmatched facilities and services who proudly recommend their family members and friends to get the Umrah packages from us. We are constantly looking for opportunities and possibilities to fulfil every need of our customers and to improve our services. Take advantage of our exclusive November Umrah packages 2019 and last minute deals of year 2019 to travel to the sacred cities of Makkah and Madinah for Umrah. I’timaar offers you a chance to plan your Umrah by choosing the best November Umrah deals according to your requirements and schedule. We make sure that you spend your November holidays in the best way by travelling to Makkah for pilgrimage and spiritual satisfaction. Pilgrims have the flexibility to choose the date and place of departure. You can also pick the city airport from where you depart for the holy cities. Heathrow airport is the most popular departure point for people embarking for their Umrah tour. Pilgrims have the option to choose either direct or cheap connecting flight in the month of November from London to Jeddah or Madinah. If one wishes to go on a city break to Dubai or any other place, stopover flights can be arranged at their request in their November Umrah trip. Pilgrims are offered a choice between Jeddah and Medina for arrival while booking their November Umrah package 2019. Pilgrims arriving in Jeddah can travel to Makkah either by private transportation or Haramain High-Speed Railway. Perform your Umrah comfortably by choosing from our Luxury Umrah Packages and planning your spiritual journey in detail along with the airport departure, 4-star or 5-star hotel stay near Haram and Prophet’s Mosque. The UK residents can choose to depart mainly from Heathrow, Birmingham or Manchester airports. We offer luxury business class flights from London to Jeddah along with accommodation in the top hotels. Book your luxury Umrah packages for November 2019 at the lowest rates and get world-class facilities to perform Umrah with ease and comfort. If you are planning to go on Umrah with family, this is the best type of Umrah package for you. 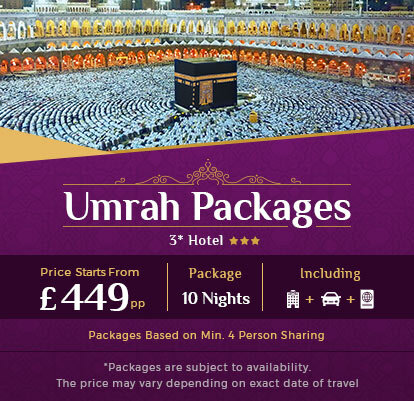 I’timaar offers the cheapest budget Umrah packages with affordable 3-star hotels and economical flights which lets the Muslims of UK to perform Umrah at the lowest cost. With our November Umrah packages, we ensure that pilgrims are offered economical hotels near Haram and the ground transportation is provided to reach Masjid al-Haram. Pilgrims willing to go on ziyarat of holy places can opt for our on-demand local transportation facilities. A tour guide can also be arranged on your trip to the historical and Islamic sites of Makkah and Madinah. You can also include meals in your November Umrah package deals. If you have any specific hotel in mind to stay during your Umrah we can also help you in booking that hotel at the lowest rates. We have partnered with all the hotels near Haram so that we remain true to our promise. Our exclusive Umrah packages are designed keeping your comfort and requirements in mind. I’timaar allows you to include direct, non-stop or connecting flights as part of your Umrah package ensuring you get the best value for your money. With direct flight, one takes the straight route for Jeddah or Madinah whereas the connecting flight helps you save money, keeping the price of the package minimum. You can also plan your Umrah with a stop-over in Dubai or elsewhere if you want. The pilgrims can choose to arrive in Jeddah or Madinah. From Jeddah you can travel to Makkah or Madinah via high-speed railways. Transport expenses are included in the Umrah package. Why November is a Suitable Time to Perform Umrah? Umrah is a sacred journey extremely close to the hearts of Muslims. Planning a visit to Saudi Arabia to perform Umrah can be very stressful, so why not leave it to the experts? Every day, scores of pilgrims perform this holy ritual in order to make Allah (SWT) happy and seek blessings and forgiveness from Him. It takes a lot of money and time to fulfil this purpose. November is a good month to perform Umrah due to the milder weather and lesser crowd. The climate of Saudi Arabia is harsh which makes it hard for pilgrims to concentrate on worshipping and performing the rituals. The temperature starts falling down in the month of November and it becomes much more convenient to perform the rituals of Umrah. The temperature will not be too high and you will get less exhausted. Do not delay your Umrah trip and plan your Umrah in November which is a great time of the year for undertaking this sacred journey. Also Read: How to Make the Best of Your Umrah Pilgrimage? While planning your Umrah, we ensure that you enjoy authentic Arabian meals in your journey. A trip to Makkah and Madinah is incomplete without exploring the various historical and Islamic sites. We arrange on-demand transportation along with your November Umrah deals so that you are able to explore the Islamic traditions on your trip. An experienced travel guide will also accompany you to educate you about the historical background. Recommended: Places to Eat in Makkah? If you want to go for Umrah in the month of November with your family or in a group, I’timaar is the right platform to get attractive Umrah deals for groups and families at the lowest prices. Just let us know about the time when you are thinking about travelling to Saudi Arabia for Umrah and we will customise your Umrah package at the most affordable rate. If travelling in a group, we ensure that the number of pilgrims in a group is kept low at any specific time. With family Umrah packages, if a person is travelling with kids or elders, we make sure that accommodation closer to Haram and other facilities are provided in the package. Muslims from London, Manchester and Birmingham or anywhere in the UK wishing to go for Umrah can choose their November Umrah packages from I’timaar on heavy discounted prices. 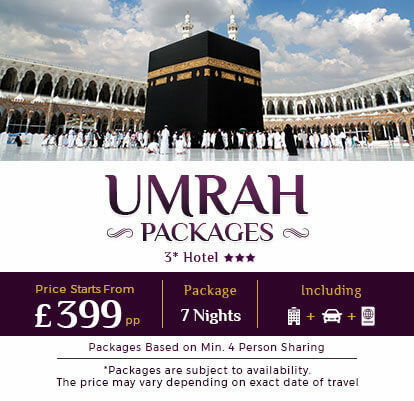 Our cheap November Umrah packages have gained popularity amongst Muslims of UK. To book your Umrah, we only require necessary information including a valid passport and vaccination certificates. As part of your package, your return tickets and accommodation in Makkah and Madinah will be booked and your visa application will be sent to the Ministry of Hajj & Umrah in Saudi Arabia for approval. You can get in touch with our Umrah travel consultants to plan your Umrah trip.